Shares of Mattel (NASDAQ:MAT), a global learning, development, and play company with brands that include Barbie, Fisher-Price, Hot Wheels, and many more, are popping 10% as of 12:20 p.m. EST Friday after a rough 2018. At the time of this writing, there was no direct public news pushing the stock higher, but a combination of 2018's sell-off, a strong day for broader markets, and possibly tax-harvesting investors buying back in could all be contributing to the 10% pop. The S&P 500 and Dow Jones Industrial Average are up 3.26% and 3.15%, respectively, no doubt aiding Mattel's rise today. However, as you can see in the graph above, it's possible that some investors selling a losing investment in Mattel for tax-harvesting purposes in the couple months leading up to 2019 could have waited the 30-day period to now rebuy into Mattel without a penalty, pushing the stock higher. And honestly, sometimes stocks just go up and just go down with little direct news, especially considering the uncertainty around Mattel. Hot Wheels Super Ultimate Garage. Image source: Mattel. It's been a rough ride for long-term Mattel investors, who have seen declining demand for the company's Barbie line, loss of some Disney business to rival Hasbro, and even a surprise development from Amazon.com. And while the company's turnaround efforts remain slow, its increased focus on improving its core brand and manufacturing operations have gained a little traction after its surprise third-quarter profit, as has its rising operating income after eight consecutive quarters of year-over-year declines. 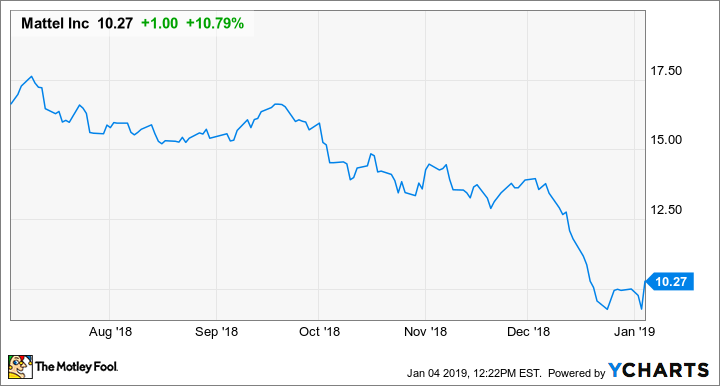 Investors should take today's 10% pop with a grain of salt and continue to watch closely to see if the third quarter was a one-hit wonder or the beginning of a slow turnaround for the battered toy company. Check out the latest Mattel earnings call transcript.